IPL 2019 Highlights: MS Dhoni and Ambati Rayudu both scored half centuries as Chennai Super Kings pulled off a thrilling four-wicket win. 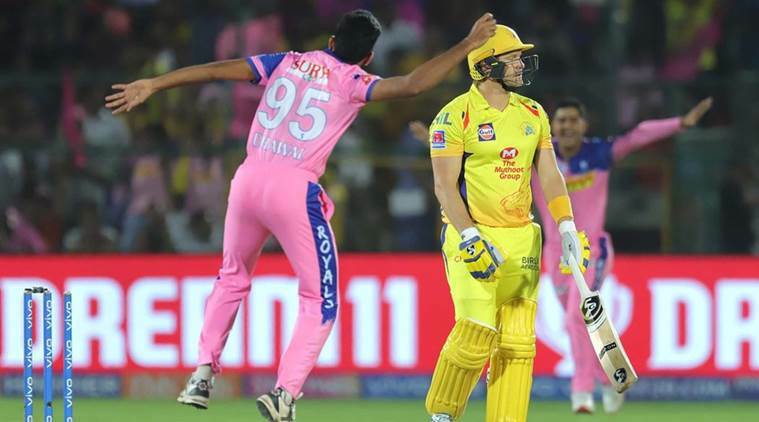 IPL 2019, RR vs CSK Highlights: Chennai Super Kings pulled off a dramatic four-wicket win against Rajasthan Royals. Chasing 152, CSK got off to a poor start with Shane Watson getting dismissed in the first over. Suresh Raina was run out in the second over. Faf du Plessis too walked back in the 4th over. He was followed by Kedar Jadhav. MS Dhoni stitched a 95-run stand with Ambati Rayudu before the latter was dismissed. In the end, CSK needed 18 to win in the final over. Mitchell Santner hit a six in the final ball to take his side to a win. CSK need 4 to win in the final ball and Ben Stokes has given a wide delivery. Now CSK need 3 to win in the final ball! MS DHONI HAS COME OUT TO THE GROUND IN ANGER!DHoni having an argument with the umpire! DHONI LOST HIS COOL! Ben Stokes has over stepped and Jadeja takes a single. This will be a free hit. The equation comes down to 10 in 5 balls. FREE HIT - MS Dhoni takes a double. CSK now need 8 to win in 4 balls. SIX! JADEJA HAS STRUCK A LYING DOWN STRAIGHT SIX! Ben Stokes too lied down on the ground and he has been watching it go over the boundary ropes. Need 12 to win in 5 balls. FOUR! MS Dhoni has smashed it hard and the ball has went between his legs towards deep backward square for a boundary. CSK need 18 runs to win in the final over. MS Dhoni runs a couple and brings up his half century in 39 balls. He looks exhausted at the moment. But the job is far from done. This is his 22nd fifty. FOUR! Short from Ben Stokes and MS Dhoni has pulled it deep backward square for a boundary. Much-needed boundary for CSK and it has made RR a bit rattled. What an over from Jofra Archer - the right-arm bowler just gave 7 runs in the over. Three overs remaining and CSK need 39 more to win. Archer still has one over left. This will go down to the wire. FOUR! Short delivery from Unadkat and Ambati Rayudu has pulled it past mid-on for another boundary. He brings up his half century in style. Also takes CSK's total past 100-run mark. SIX! Ambati Rayudu has smashed a six over extra cover for another six. This has been hit cleanly and it has travelled the distance. Much-needed boundary. SIX! Ambati Rayudu has smashed a wide delivery from Ben Stokes over extra cover for a maximum. This partnership is slowly taking the match away from Rajasthan's grasp. FOUR! Straight hit from Ambati Rayudu - Riyan Parag has been hit for boundaries in this over. One bounce four, over the ropes. Rayudu and Dhoni are doing it for CSK. SIX! Flat six from MS Dhoni - he is the epitome of stand and deliver. That is hit hard and strong and it has hit the boundary ropes. CSK need more of this. Ambati Rayudu takes a single to bring 50 up for CSK. It has taken CSK 10 overs to reach the mark. WOW! This is MS Dhoni at his best. Pitched it fuller and Mahi stepped up to launch it over midwicket for a massive six. Shreays Gopal has been slammed hard here. Steve Smith convinces Rajasthan Royals to call for a review on a denied caught behind appeal against Kedar Jadhav. The replays showed it was missing the bat with some distance. SIX! Ambati Rayudu takes it upon himself to accelerate. Steps up to Dhawal Kulkarni and gives it all. The ball travelled the distance, to land into the stands for the maximum. Shane Watson and Faf du Plessis out to begin chase for Chennai Super Kings. Dhawal Kulkarni starts the attack for Rajasthan Royals. CHASE IS ON! "I am happy the way I'm bowling. I'm enjoying my game, whether I'm playing IPL, ODIs or Tests. I started playing IPL in Rajasthan, and I always wanted to come here and play. The crowd's support was amazing when I played and now there is the love of yellow jersey too. I was looking for his (Steve Smith's) wicket [which was his 100th in the IPL], I was not trying to restrict him. I knew the ball was spinning, so I just wanted to put it there. We have good variety (in our bowling attack) and everyone knows what to do. Hopefully we continue with our momentum." 18 runs in the final over from Shreyas Gopal and Joffra Archer as Rajasthan Royals finish 151/7 in 20 overs. CSK need 152 to win. FOUR! Archer smashes a short ball to deep backward square leg for another boundary. 150 up for RR. FOUR! Shreyas Gopal is on fire! Shorter delivery from Shardul Thakur and Gopal has smashed it over the bowler's head for a straight boundary. He is now on 12 off 5. SIX! He follows it up with a straight six. Stepped out of his crease, gave himself room and launched it over to the stands. A much-needed boundary from Shreyas Gopal. He moved away from the stumps to give himself some room and then he smashed it over the fielders. The ball landed just a step away from the boundary ropes. 18 overs gone, Rajasthan Royals are 125/6. Joffra Archer and Ben Stokes need to go hard in the final two overs. Deepak Chahar and Shardul Thakur will bowl the two overs. IS THAT RUN OUT!? THis is close. Archer could be run out at the non striker's end going for the second. The replays showed that Ben Stokes had reached his crease. Ravindra Jadeja has now taken 100 wickets in IPL! FOUR! Steve Smith shows his class - Chahar missed his line and Smith pounced on it. Smashed it through the covers for four. Exquisite strokeplay. 50 up for Rajasthan.